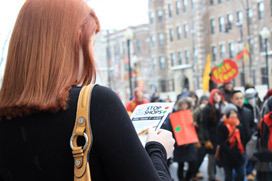 Posted on March 2, 2011 March 30, 2013 by Marley M.
D.C. Fair Food took a bus full of students from Georgetown University’s Georgetown Solidarity Committee, Georgetown Washington University’s Progressive Student Union and Students for Fair Trade, and American University’s MEChA group as well as a representative from Washington D.C.’s Union de Trabajadores to Boston for the biggest action the CIW has ever done in the Northeast! 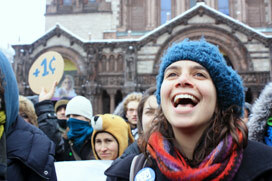 Check out the photo essay below, and the video in our Media! 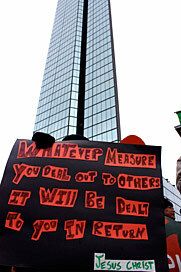 page above! 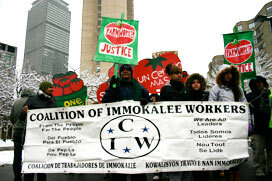 After two long days and 1,500 miles on the road, the Coalition of Immokalee Workers landed in Boston and brought its message of respect for fundamental human rights to the town where the American Revolution was born. 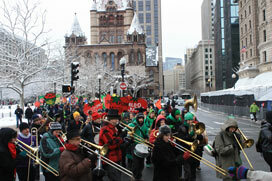 Waking up to a wintry scene with several inches of newly fallen snow on the ground, the marchers didn’t know what to expect when they arrived at historic Copley Square in downtown Boston. 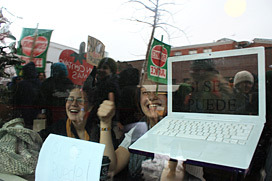 They were greeted, however, by hundreds of supporters from throughout the Northeast who were undeterred by the frigid weather. 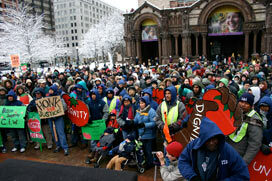 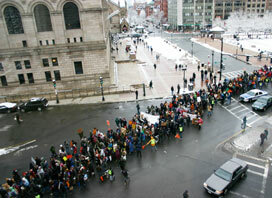 Despite the intense cold and a snow that continued to fall throughout the day, the crowd grew steadily over the course of the hour-long rally, which featured several local speakers, including several religious leaders from the greater Boston area, and a few national leaders, too, including Frances Moore Lappe (author of “Diet for a Small Planet”) and Josh Viertel of Slow Food USA. 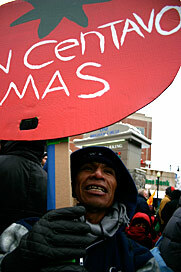 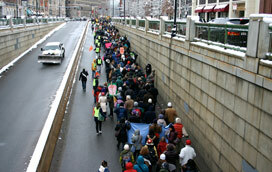 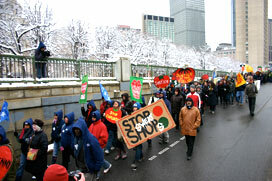 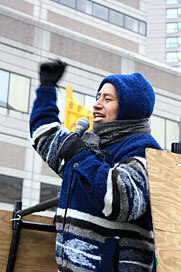 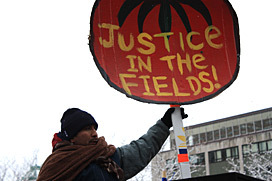 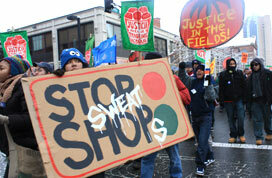 … justice that became even more clear and stark for the crew from Immokalee — shown here leading the crowd out of Copley Square to begin the march — as the proximity to Stop & Shop’s nearby corporate headquarters heightened the sting of the company’s inexcusable refusal to join the Fair Food program. 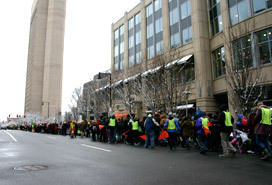 Behind the CIW contingent followed our very own marching band, the Rude Mechanical Orchestra out of New York City, who provided rhythm and spirit throughout the march. 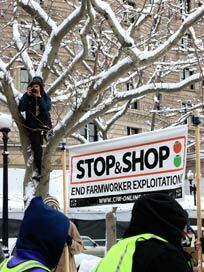 … and others new to the campaign, like this one, pictured as the march passed the foot of Boston’s John Hancock Tower, that should serve as a cautionary note for the decision-makers at Stop & Shop and its $40 billion parent company Ahold. 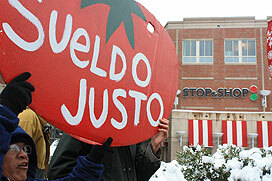 … the Stop & Shop at Brigham Circle, where the crowd was so large that it had to divide itself into four separate pickets on sidewalks adjacent to and facing the store. 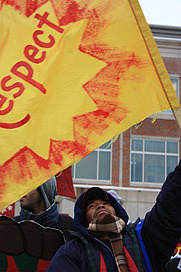 The day’s action ended as it began, with a simple message of justice — of respect — for some of the country’s worst-paid, least-protected workers. 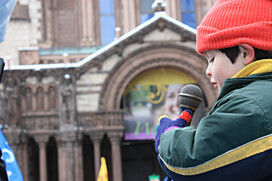 And once it was all over, it was time to catch up with our new friends from Boston. 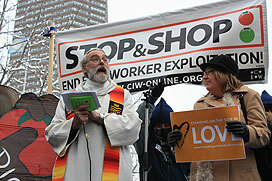 On the left, the Rev. 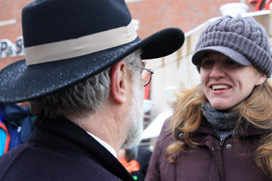 Peter Wells of the United Church of Christ, speaks with Meghan Cohorst of the Student/Farmworker Alliance, whose hard work in Boston over the past several weeks not only produced a remarkably strong and vibrant march, but also laid the groundwork for many more actions in the future, until Stop & Shop hears the call of its consumers and meets the ethical purchasing standards established by farmworkers in Immokalee, taken up by leading food retailers, and implemented by virtually the entire Florida tomato industry.